MEXICO CITY IS THE capital of the country of MEXICO. The city is located in the Valley of Mexico on the central Mexican plateau. The core of the city is comprised of the Federal District. However, the Mexico City metropolitan area goes well beyond the boundaries of the Federal District into the surrounding states. With a population of around 20 million, the Mexico City metropolitan area is one of the largest cities in the world. The current site of Mexico City is located on top of Tenochtitlán, the capital of the Aztec Empire. The Aztecs founded Tenochtitlán in the 14th century on two small islands in Lake Texcoco. Three causeways connected the city to the mainland. Tenochtitlán grew into the largest city in the Americas before the arrival of Europeans. When the Spanish arrived in the early 1500s, the city had a population of more than 100,000 people. The city contained a large and impressive marketplace at Tlatelolco. Tenochtitlán also possessed an extensive palace complex for the Aztec emperors and hundreds of religious temples. The Spanish destroyed much of the city between 1519 and 1521. After conquering the Aztecs, the Spanish constructed their own city over the ruins of the Aztec capital. Constant flooding soon led the Spanish to fill in the lakes in the Valley of Mexico. Mexico City came to be the biggest and most important city in the New World. It served as the capital of the Viceroyalty of New Spain and rivaled European cities in size and wealth. Much of the wealth from Mexico’s silver mines made the city prosperous. Already by 1560, Mexico City had a university, the printing press, and large, impressive public buildings and churches. It served as the political, religious, economic, and cultural center of New Spain. Mexico City was also a study in contrasts, as along with the great wealth there was much poverty. There was also much ethnic diversity in the city, as the population consisted of Spaniards, Native Americans, and Africans, along with new racially mixed groups such as mestizos and mulattoes. After Mexico achieved its independence from SPAIN, Mexico City became part of a Federal District, which the new government created in 1824 to serve as the political capital of the country. The city grew slowly in the first half of the nineteenth century. A number of important events and developments occurred starting around mid-century. During the 1840s, troops from the UNITED STATES occupied Mexico City. In the 1850s, during a movement simply known as La Reforma, the government expropriated Church lands in the city, which in turn led to an opening up of the real estate market beyond the historical central district. This situation led to the city’s first significant population shift, as many elite families moved to the west. Mexico City expanded in the 1860s under Maximilian I, who built the well-known avenue Paseo del Emperador, today known as the Paseo de la Reforma. During the dictatorship of Porfirio Díaz, which began in 1876, Mexico City was greatly modernized along the lines of PARIS, showing much French influence. There were many improvements in utilities and services, such as a new drainage system, gas and electrical lighting, and streetcars. Improvement in urban transportation in particular allowed for the continued spatial expansion of the city. From 1900 to about 1930, Mexico City experienced even more urbanization. During the Mexican Revolution of the 1910s, the population of Mexico City grew as many people fled the countryside. Building in the city resumed in 1924 with the construction of the Avendia Insurgentes. In this period, many members of the middle and upper classes moved to the south and west. The historic center of the city took on an increasingly bureaucratic function. Nevertheless, most residents still lived within the city proper. As late as 1930, 98 percent of the population lived within the city limits. During the 1930s and 1940s, Mexico City experienced even more spatial and demographic growth. The earliest skyscrapers appeared in the 1930s, although the threat of earthquakes kept them small. The city became less concentrated, as residents moved north and south, in large part because of industrial expansion. More of the population lived in areas of the Federal District outside the legal limits of Mexico City. Beginning about 1950, the city grew significantly because of a prospering economy fueled by oil exports. The population began to spill over the border of the Federal District into the state of Mexico. An example of the population movement was the 1957 creation of Ciudad Satélite, a middle-class suburban development. Population expansion continued in the 1960s with more industrial expansion and the growth of squatter settlements. For example, the squatter settlement of Nezahualcoytl grew from 65,000 to 650,000 in the 1960s, then reached 1.3 million by 1975. By the 1980s, nearly half of the city’s population resided in slums and squatter settlements. Mexico City hosted the Summer Olympics in 1968 and opened its subway the following year. The year 1968 also witnessed a massacre of student demonstrators at the Tlatelolco housing complex. The economic crisis of the 1980s led to decreased spending on urban services even as the city grew in population. A major earthquake struck Mexico City in 1985, destroying many buildings and killing some 7,000 people. This earthquake led to a new construction code for the city. 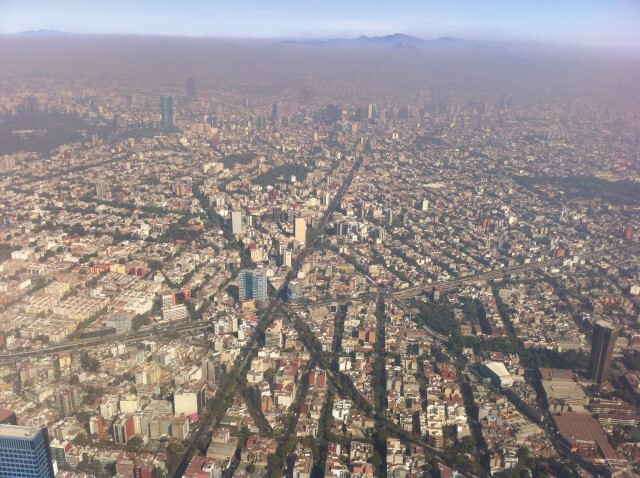 By the end of the 20th century, Mexico City faced a number of critical urban problems, including severe air pollution and major traffic congestion.